Scarborough News Saturday League Division One title-chasers Edgehill play host to Division Two high-flyers Scalby this weekend in the pick of the NRCFA Saturday Challenge Cup second round matches. Both sides have made good starts to their league campaigns but Edgehill boss Steve Clegg is fully aware of the dangers of playing lower league opposition. Scalby will be hoping they can cause a major cup upset against the hosts. The Otters currently boast a 100% record in Division Two and they have impressed against top-flight sides in the cup already this campaign. Ben Webster has netted six goals from the centre of midfield in Scalby’s successful start to the season. Webster, who signed from Union Rovers towards the end of last season, said: “We are doing well this season in the league and the cup. “We’ve already beaten Cayton on penalties in one competition and I thought we were unlucky against Hunmanby United in the League Cup last weekend. Webster added: “We have a lot of pace out wide though, which will cause problems for any team and we have nothing to prove because we are the underdogs. 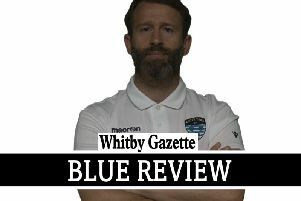 Cayton v Dormanstown, Redcar Atheltic Res v Newlands, Scalby v Edgehill, West Pier v Bedale Res, Cayton Corinthians Res v Ryedale SC, Itis Itis Rovers v Helperby, Whitby Fisherman’s v Copmanthorpe Res. North Cave v Hunmanby United. Filey Town v Whitby RUFC, Westover Wasps v Sleights. Duchess v Seamer Sports Res, Edgehill Res v Falsgrave Athletic, Newlands Res v West Pier Res, Filey Town Res v Snainton. Commercial v Sherburn, Eastway Sports v Scalby Res, Fishburn Park Res v FC Rossette, Hunmanby United Res v Westover Wasps Res, Sleights Res v Filey Town 3rds.